Announcement One of a kind upcycled clothing and accessories. I am constantly on the look out for wonderful pieces that catch my eye. I bring them home and use the huge variety of embellishments that I have collected to make a one of a kind piece. If you have any questions ,please feel free to contact me. One of a kind upcycled clothing and accessories. I am constantly on the look out for wonderful pieces that catch my eye. I bring them home and use the huge variety of embellishments that I have collected to make a one of a kind piece. Really cool jeans. Luv the added pieces. Really chic! Just finished a new batch of upcycled art to wear shirts! 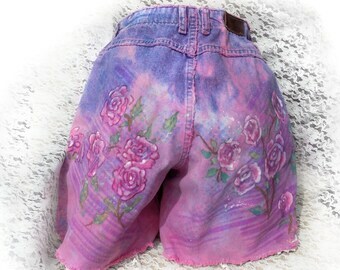 New jean upcycled skirts are here! Everything I create, I want it to be a work of Art, whether painting,clothing to Home Decor. so www.JunkerJean.etsy.com / became to be. * I have been painting Watercolors and oils for the last 40 years (guess that tells age) I did major Art shows between the Rocky Mt. and the East Coast. I no longer do Art shows ,so www.EJeanBogerFineArts.etsy.com./ became to be. www.jeanniesemporium.etsy.com / became to be. * I lost my husband after 42 years (why I stopped doing Art shows) So kind of in remembrance of him, www.johnnysapparel.etsy. / became to be. so www.firedupladieshome.etsy.co / became to be. * What is not to like about jewelry? Why not out of clay? so www.firedupladiesbeads.etsy.com / became to be. 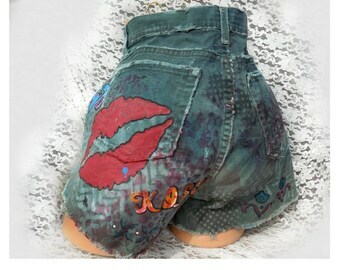 I love to embellish, distress, and dress up those old forgotten items. Whether it's Clothes or Home Decor, I try to make that unique one- of- a -kind piece that will get you the complements and raves. I Upcycle, embellish, distress and re-purpose forgotten items. I am always on the hunt for those fantastic pieces that catch my eye. Then I bring them home to make the one of a kind creations you see here. I have worked in all kinds of different media. I love to create one of a kind pieces that nobody else has. All my items are described as accurate as I can. I also try very hard to take good photos so you can see what you are buying. Here is a link with instructions "How to Pay Using Paypal"
*CREDIT AND DEBIT CARD CUSTOMERS - You do not need a Paypal account to pay for your items through Paypal! Choose the Paypal option during checkout. After you submit your order, click the "pay now" button. Scroll down and you will see the option to pay with credit or debit card without having to sign up for a Paypal account. I also combine shipping with my other Etsy stores. I will refund the difference in shipping through which ever payment was made. I will be shipping through the United States Post Office, Depending on the weight will determine which way I ship. (priority, flat rate, or standard) I will ship whatever way is cheapest to you. I will be shipping 5 days a week. Monday Thur Friday. The combined shipping cost is at full price on each of my listings. Once you have placed an order I will combine the pieces together in as few boxes as possible, so that the pieces will arrive safe and sound. I will refund any shipping costs paid over $1.00 of the actual cost of postage. International Customers - Customs fees/duty taxes/VAT (Value Added Tax) are the buyer's responsibility. I mark my all packages as merchandise and put the invoiced value on them. I also combine shipping in all of my shops, refunded once shipping label is made.